Hotels near Port Everglades that provides excellent service at affordable rates is rare but can found at the Rodeway Inn & Suites. Call us now! We are proud to say that we provide the same services and vast amenities as many of the larger hotels and resorts do. Our affordable rates are just what you’re looking for in a fancy hotel, but half the price! You’ll also be happy to hear that we offer a free round-trip shuttle to and from the airport and hotel. We try to make it as convenient as possible for you! When you stay with us, you won’t be scrambling around to find a ride here or there, we got you covered! You’ll see there is something for everyone when you stay with us! Hotels near Port Everglades can put a ding in your bank account if you don't know where to look. Look to us at Rodeway Inn & Suites to give you exceptional service and low prices! Our hotel is one of the best options to choose, in that we are affordable, and will make your stay in South Florida a memorable one. Our hotel is located between Miami and Fort Lauderdale and near Fort Lauderdale Airport and the Greater Fort Lauderdale Convention center. If you’re looking to stay a day or week, we can handle your request. We are the perfect place to stay in that we have many amenities, FREE Wi-Fi, and FREE breakfast for you to enjoy every morning. Don't delay any longer! Get The Best Available Rates! Free Shuttle to & from Fort Lauderdale Airport. Why Stay With The Rodeway Inn Hotel Fort Lauderdale? 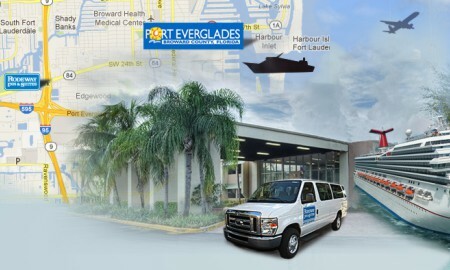 We not only one of the most reasonable rates hotel around, but we are one of the hotels near Port Everglades. So whey you are getting ready for your next cruise and want to be close to your cruise and plenty of things to do you want to stay here! Cruise-goers and non-cruise-goers alike, we are the hotel where you can get the most, and the best, for your money! For example, we have recently expanded our transportation services to include tours, transportation throughout all of South Florida, and drop off and pick up services from the cruise ports! BOOK DIRECT today for the best rates in South Florida! We have recently renovated our hotel, and are conveniently located near the Seminole Hard Rock, famous sports stadiums, multiple concert arenas, beautiful beaches, the University of Miami Hurricanes, the Broward Convention Center, all the greatest local shopping malls, restaurants, nightlife, a multitude of exciting attractions like Butterfly World, Miami Seaquarium, and more!